Think of the Park Avenue story as a much-loved play that never closes. The show goes on year-after-year running through directors, cast and crew who strive to keep the play fresh — and producers who struggle to keep investors happy. When times get tough, producers may replace the star or maybe just repaint the lobby. Sometimes they drop ticket prices. Sometimes the public responds well. Sometimes they don’t. This year’s twist on Winter Park’s long-playing zoning drama is the furor produced by city efforts to revitalize one corner of the “Avenue” – the block between Fairbanks and City Hall. All recent zoning-change proposals submitted by city staff — including the current proposal to change rules for Avenue restaurants — have been poorly received by Winter Park merchants and residents who are deeply suspicious of any changes to Park Avenue zoning. In an attempt to better understand the city’s current proposal – and to find common ground –Commissioners Tom McMacken and Steve Leary agreed to meet last week. The December 4 meeting was publicized as required by Florida’s Sunshine Law and attended by the two commissioners, staff and a handful of city residents and merchants. Jeff Briggs, Director of City Planning, has pointed out again and again that rule changes on the Avenue are nothing new. Historically, city leaders and staff have responded to changing times (and fortunes) by tightening and loosening city ordinances regulating Park Avenue commerce. Recently, city staff worked hard to accommodate Burger Fi, a popular new player at the south end of Park Avenue. Public response to the restaurant has been good, but now, city staff and the restaurant are in hot water over “Fine Dining” rules that were bent, then broken. The latest proposal to recast Park Avenue — and the tepid support it has received — raises the question of whether city leaders will once again pull back their proposal in deference to the fears of the stars and established cast on the Avenue who are clearly worried that the wrong sort of player could spoil the show. The video clip shown above is an excerpted record of the meeting between the commissioners. This video is one of a series that will showcase city meetings at which proposed ordinances, initiatives and city policies are developed and vetted. Readers who want to access full-length coverage of these events can often find audio recordings of the meetings on the city’s website here. Commissioners, board members and other meeting participants who wish to correct or expand on WPV coverage of these meetings are welcome to submit comments, articles and columns for publication in the Voice. Is the Winter Park YMCA a neighborhood center — hoping to expand so they can offer enhanced services to local families? Or, are they an ever-expanding fitness empire intent on pumping up their regional membership revenues — regardless of the impact on their neighbors? 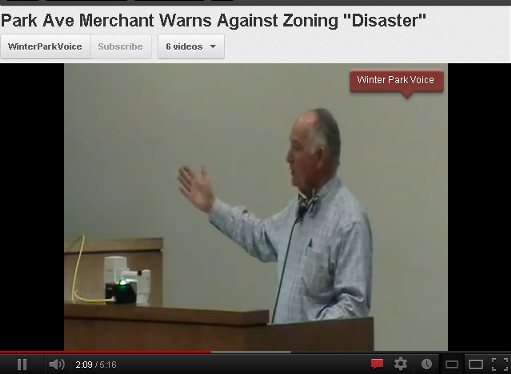 Proponents of both points of view faced-off at the Winter Park Planning and Zoning hearing on November 6. 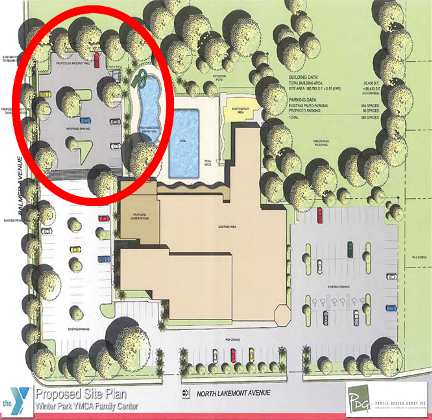 At issue is the YMCA’s latest plan to add a parking lot and a new shallow, “zero-entry” pool. A similar plan was submitted to the city by the YMCA in 2010, but was withdrawn by the Y after it was denied by P&Z. A few years before the 2010 denial, the Y had purchased two adjacent Palmer Avenue homes and held the property – in the apparent hope that their expansion plans would be better-received by the city’s P&Z and City Commission at some point in the future. Despite their failure to secure city approval in 2010, the YMCA continued to hold their properties on Palmer and waited until 2012 to re-submit their expansion request to the city. This time the current P&Z board proved to be more sympathetic to the YMCA’s plan. On November 6, the board approved the request and sent it on to the City Commission, which will start hearings on the matter on November 26. UPDATE: In the City Commission meeting on November 26, the Commission approved the YMCA’s request to modify the legal status of the Y’s two residential properties on Palmer Avenue. The vote was the first of two votes required to clear the way for the Y to expand its parking lot farther west on Palmer by changing “. . . the existing designation of Single Family Residential to Institutional and [by changing] the existing zoning designation of Single Family Residential District to Public Quasi-Public District” as reported by the city’s newsletter, citE-news. The Commission also voted to approve the construction of a new YMCA swimming pool without a slide and a new parking lot with 30 spaces. As noted in the hearing, the pool could be built on property already zoned for that use, but the parking lot cannot be built unless the Commission approves the re-zoning in a second vote.The Commission held 6 votes in all on related issues including whether a slide could be built at the pool, whether to re-zone the property as a parking lot only vs. the PQP designation and whether to create a perpetual 5 foot easement between the newly re-zoned property and a Palmer Avenue residential property abutting the YMCA’s property. The 5 foot easement — which was created as a possible barrier to further YMCA expansion — was approved. Most, if not all, prior WP YMCA expansion requests have encountered neighborhood opposition. The Y’s latest expansion plans have got their neighbors in the Phelps Park area crying foul — claiming that the Y’s purchase of the two homes next to their Palmer Avenue parking lot violated an agreement they signed with the city in 1997. The Development Agreement signed by the YMCA was specifically crafted to earn city approval – and quell neighborhood opposition — for one last significant expansion by the Y in 1997. The city approved the expansion in return for the YMCA’s guarantee that they would not attempt any further expansion or purchase additional land for that purpose. The YMCA’s attorney, Frank Hamner, argued the Y’s case in front of the P&Z board, questioning the constitutionality of the Development Agreement and challenging the idea that such agreements are perpetual and unchangeable over time. Hamner then turned to the community benefits offered by the Y and the additional services the proposed facilities would provide, including a new zero-entry (shallow) swimming pool for young children, seniors and disabled people who are not well-served by the Y’s current, deeper lap pool. Does Winter Park Need Another Pool & Additional YMCA Services? Also at issue is the impact on the neighborhood surrounding the Y. Neighbors claim that night-time and early morning car alarms, congestion, horn-honking and ambulances providing frequent emergency services at the Y are eroding the quality of life in the Phelps Park area. They point out that increased parking and another pool will create more members, additional traffic and boost noise in the area. The YMCA counters that these inconveniences are more than compensated for by the services they provide the community including swim lessons for young children and the Y personnel who staff the city’s Cady Way pool at no cost to the city. YMCA representatives claim that more than a third of the population of Winter Park are members of the YMCA – and point with pride to over six million visits to the Y over the last twenty years. The pros and cons of YMCA facility growth have been discussed at length in various forums. 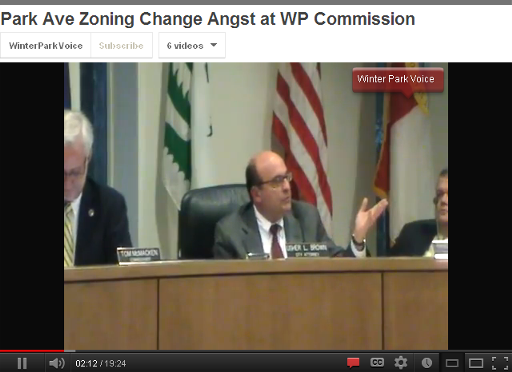 Winter Park Voice offers readers video clips featuring extensive testimony from YMCA representatives, Y members and Winter Park residents – including (below) exclusive WPV video of a neighbors who expressed their views on YMCA expansion and chronicled their day-to-day experiences living near the YMCA. 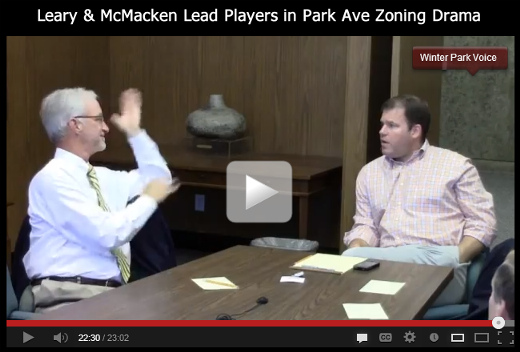 Will Park Ave Zoning Change Plan Be Revived? The city’s Economic Development Advisory Board (EDAB) is looking to inject a bit of life into the semi-deserted Park Avenue block just south of City Hall — by adding businesses that used to have a hard time getting approved for the avenue. A recent P&Z staff report supported the EDAB recommendation characterizing the five retail spaces on the avenue between Comstock and Fairbanks as inhabiting a “difficult” block that doesn’t quite fit in with the look and feel of the rest of the avenue. On July 23, the city commission tabled he controversial proposal, which now sits in limbo at city hall waiting for commissioners to revive it — or kill it. At the commission meeting, the proposal ran into stiff opposition from citizens and commissioners. The citizen group included Park Avenue merchants who were angry that the city did not notify them of the proceeding — and who opposed allowing businesses on the avenue that do not fit a “shopping and fine dining” profile. If revived, the proposal could alter the city’s C-2 zoning rules that currently discourage certain businesses from locating on Park Avenue — businesses including travel agencies, banks, government & medical offices, design studios, hair and nail salons, real estate offices, and licensed massage therapists. Some of these businesses are now located on the second floor of Park Avenue buildings, a use that is permitted under current rules. Planning & Zoning Board Approves Changes. City Commission Backs Away. Continued from Home Page… On July 10, the Planning & Zoning board voted unanimously to change the zoning rules, but choked on the inclusion of fast food restaurants. Consideration of these restaurants was sent back to staff for further study. Since this change is technically an ordinance onto itself, a two-step process is required to secure final city commission approval — assuming that the commission decides to reconsider the proposal. What exactly was the proposal tabled by the commission? According to Jeff Briggs, Director of Planning & Zoning, commissioners were being asked to vote to allow these businesses to apply for occupancy under “Permitted Use” rules. Technically, these businesses have always had the right to be considered for approval, but zoning regulations had forced them to apply under “Conditional Use” rules. Conditional Use is a longer, more arduous multi-step process that involves hearings and approval by Winter Park’s Planning & Zoning Board and the City Commission. These businesses must also verify that adequate additional parking is available to accommodate staff and customers. Park Avenue’s limited available parking is a high barrier of entry to these types of businesses. Panera Bread, a casual dining, counter-service restaurant is one notable exception. Panera’s Conditional Use application was approved by board members and commissioners because the popular restaurant provides parking for customers in an adjacent parking garage — and because it was felt that they would be a good fit in their north Park Avenue location. Had Panera Bread been a “Fine Dining” restaurant with table service provided by servers, they likely would have qualified under the city’s zoning ordinance as a Permitted Use and could have avoided the hearings and special approvals. An important difference between Permitted Use and Conditional Use applications is that the Permitted Use classification does not require the city to give notice to the community — or seek community input — prior to approval of the application. Because the proposed zoning change was tabled instead of being approved or denied, the matter remains an open question. 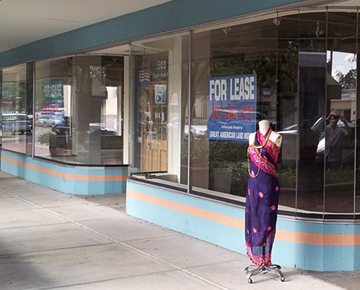 Is a zoning rule change the best way to revitalize the neglected tail-end of Park Avenue? If approved, will this “open the door” to changes on the rest of the “Avenue”? These questions may never be fully explored in a future commission hearing, but will almost certainly be discussed down the block at Park Avenue’s popular new restaurant, Burger-Fi.